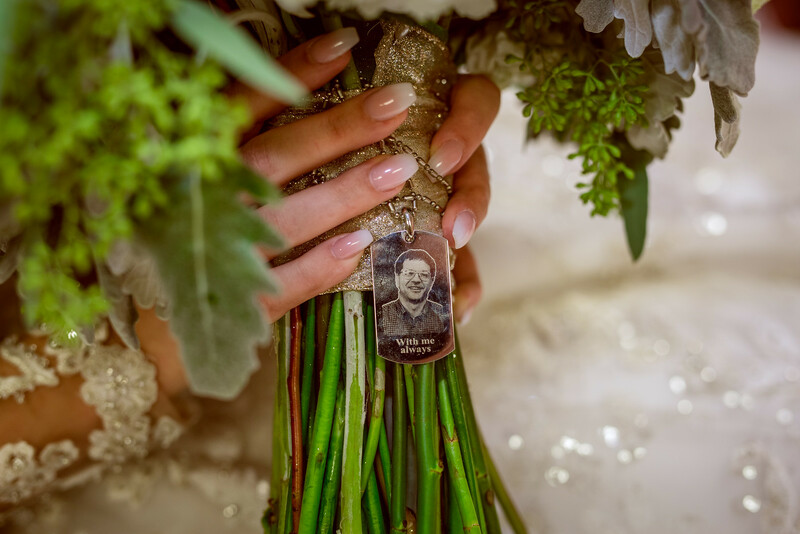 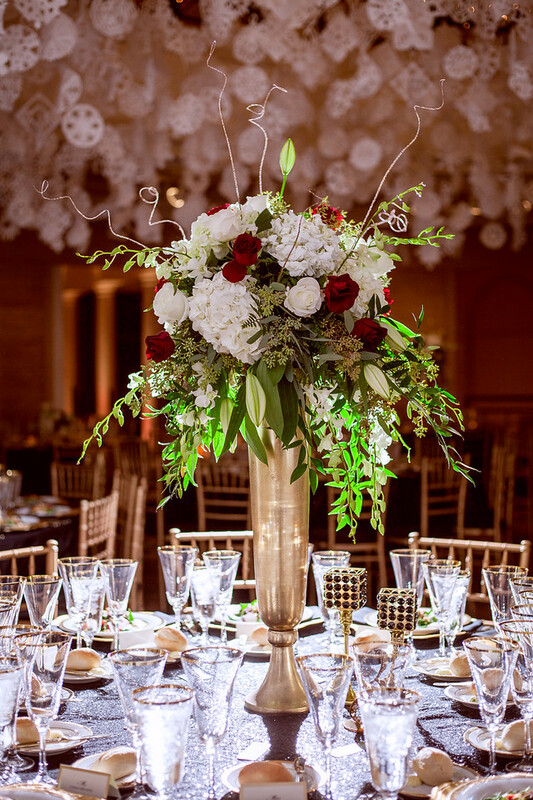 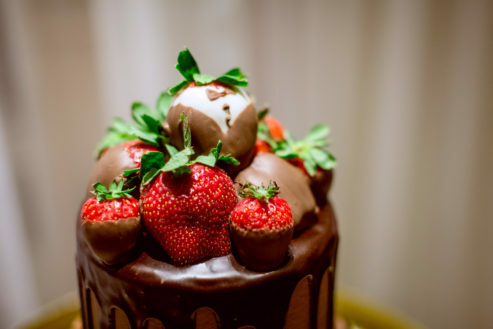 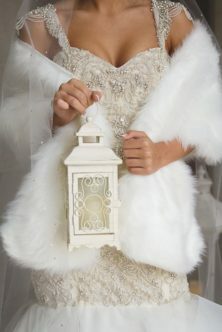 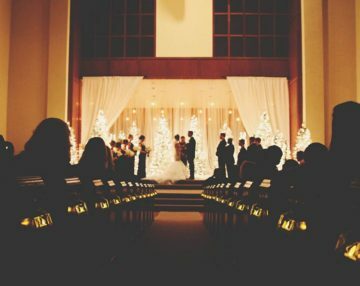 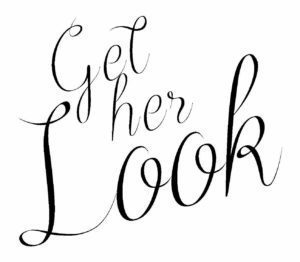 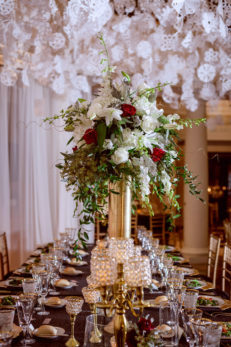 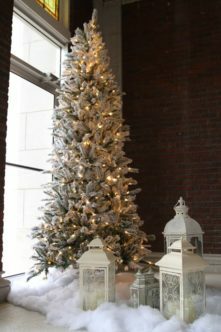 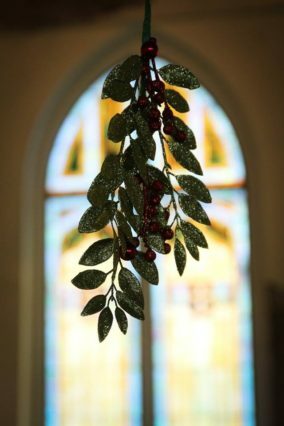 Now is the time when many of our brides are planning the details of their winter weddings and here is a little inspiration! 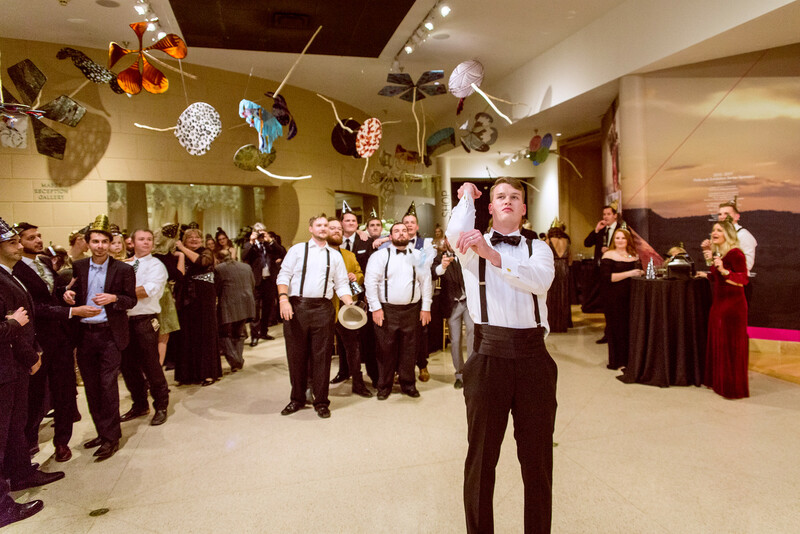 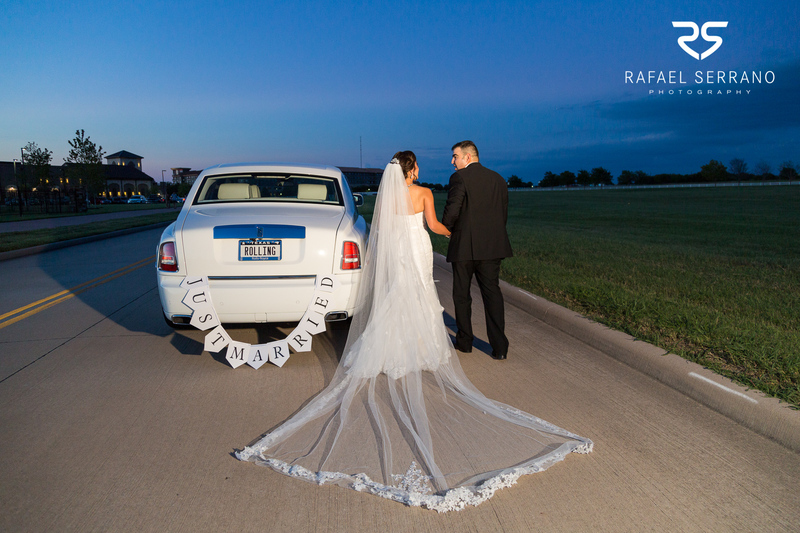 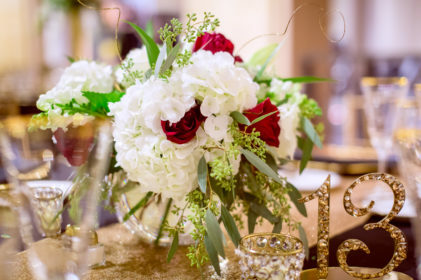 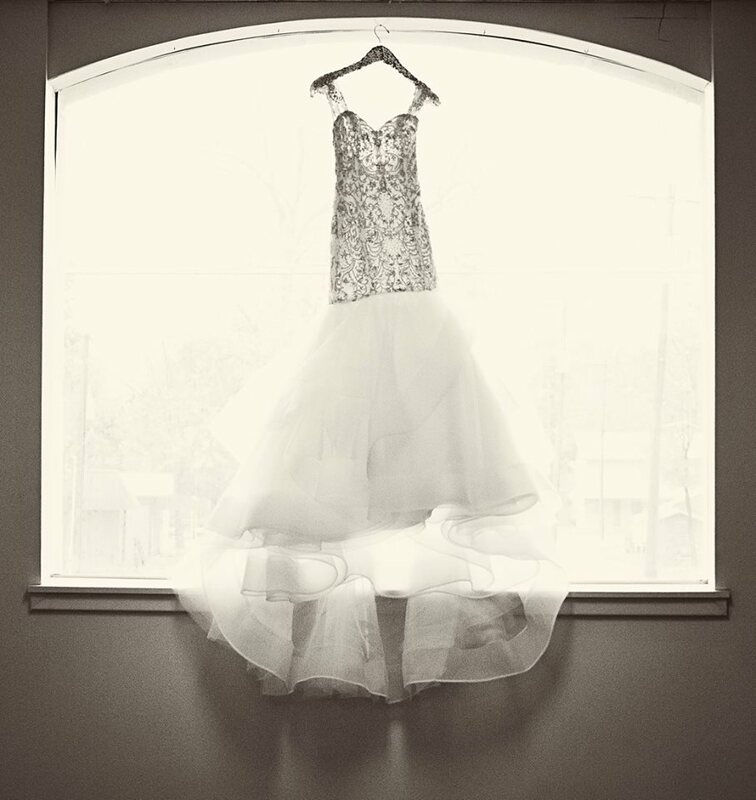 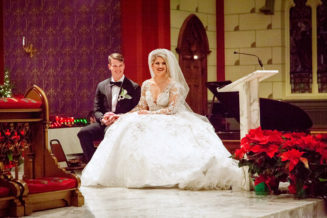 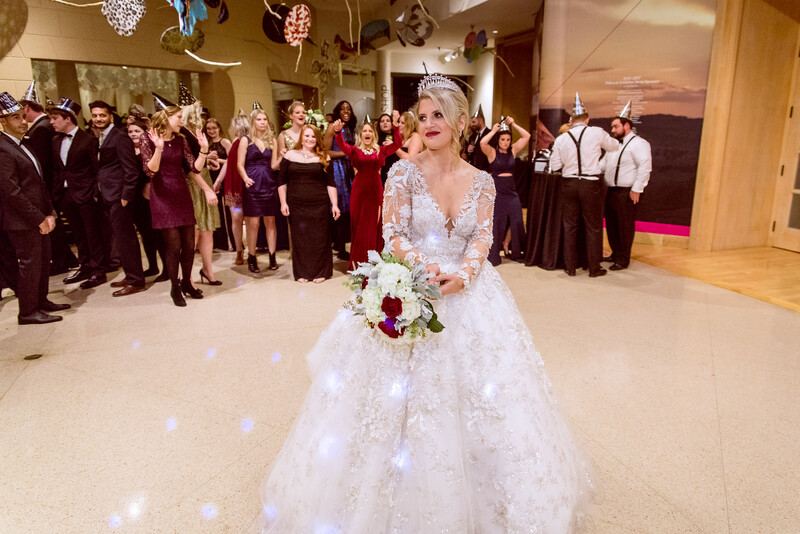 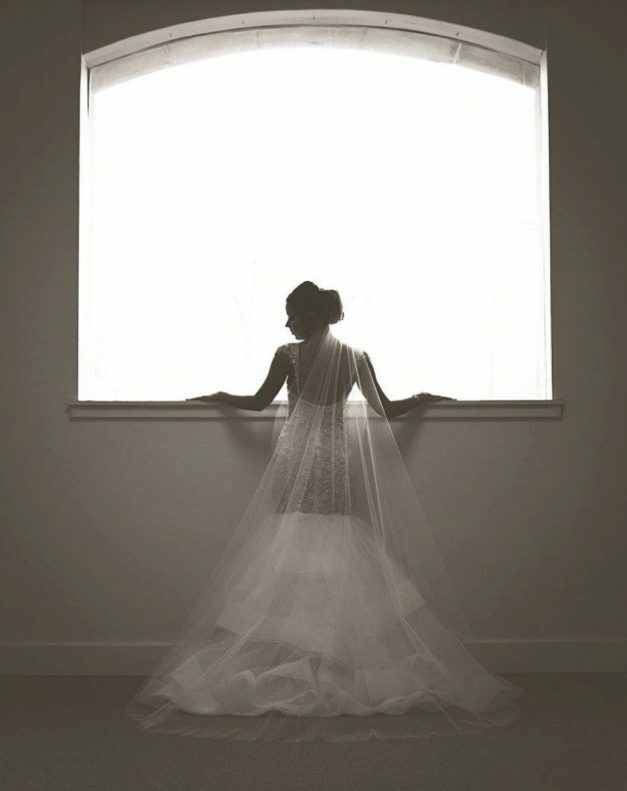 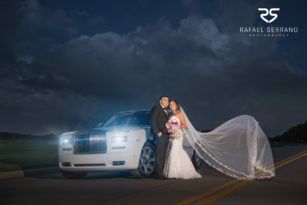 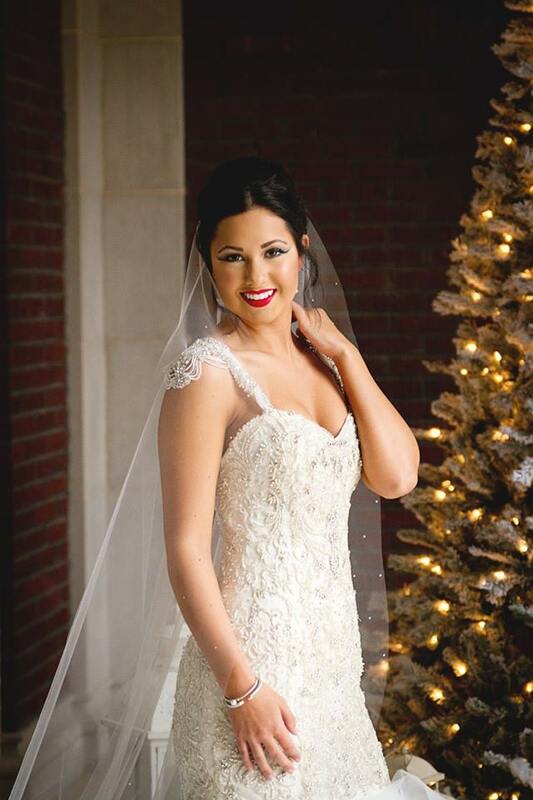 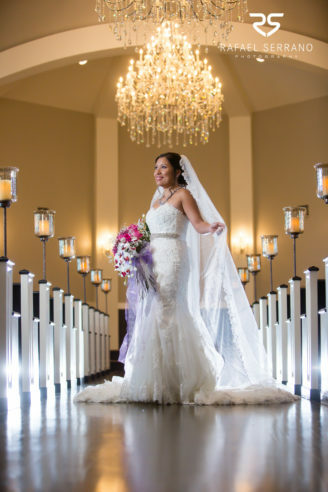 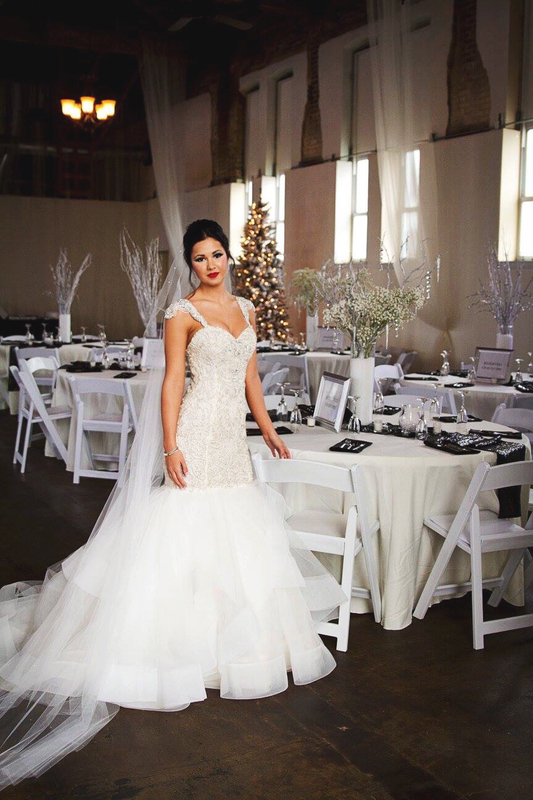 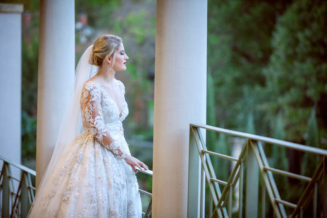 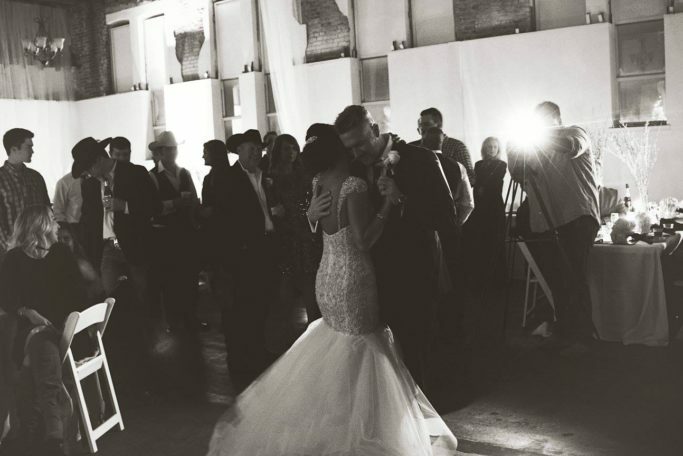 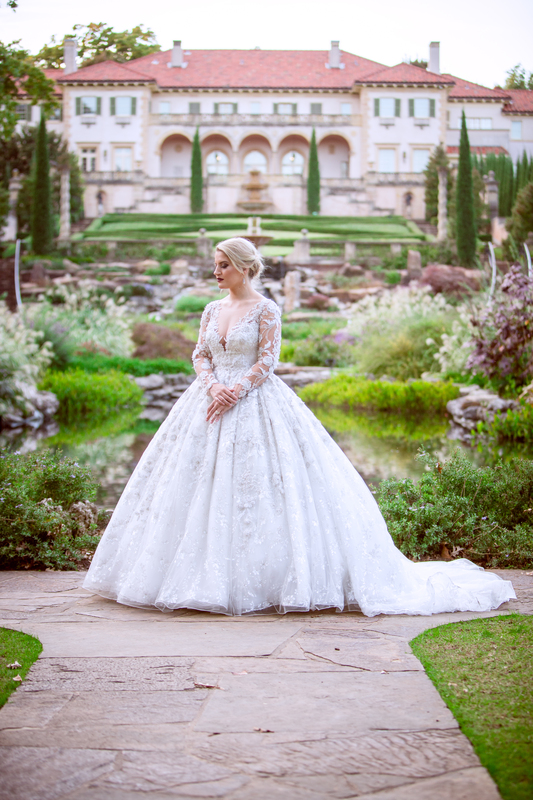 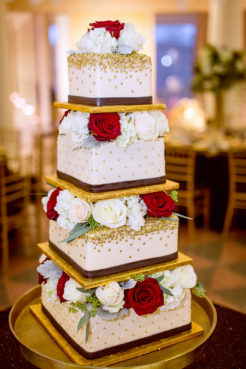 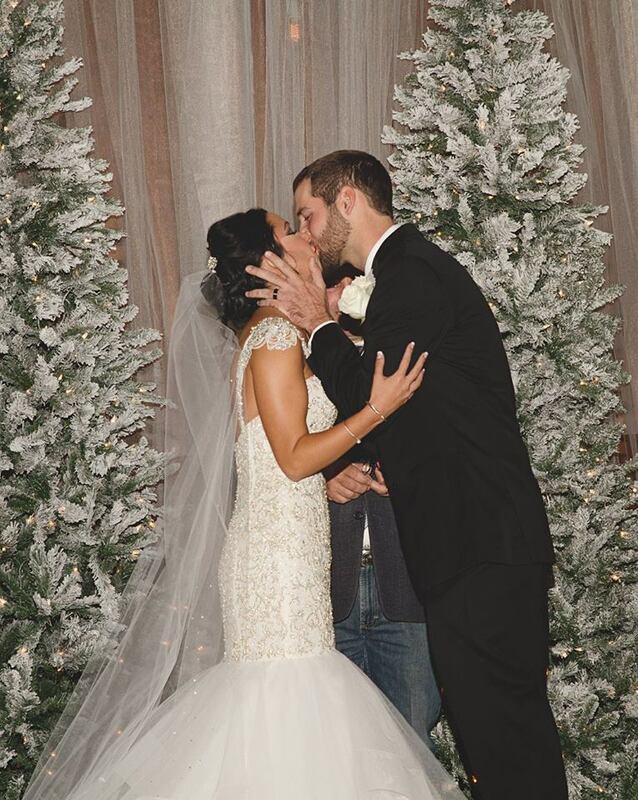 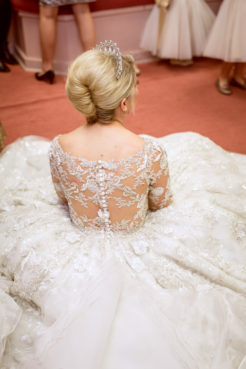 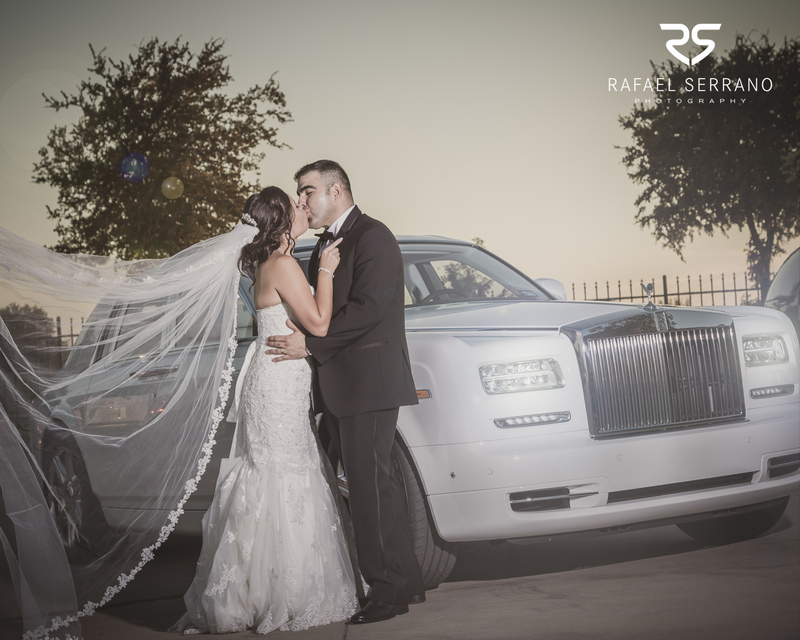 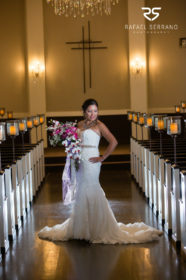 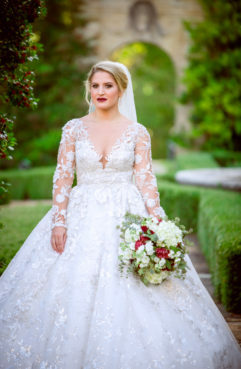 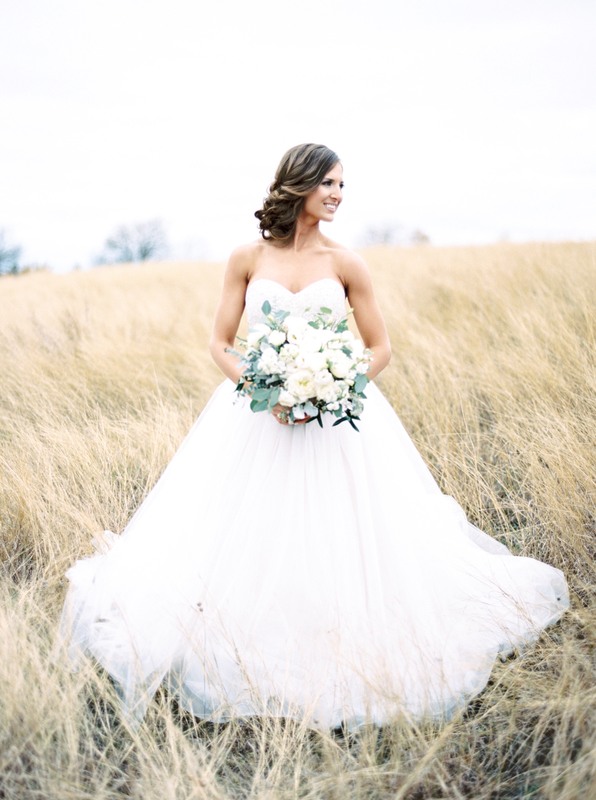 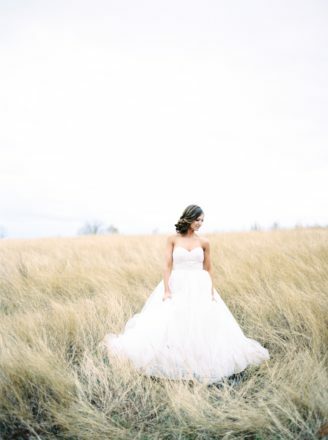 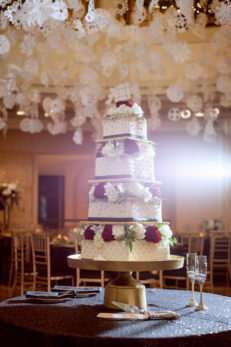 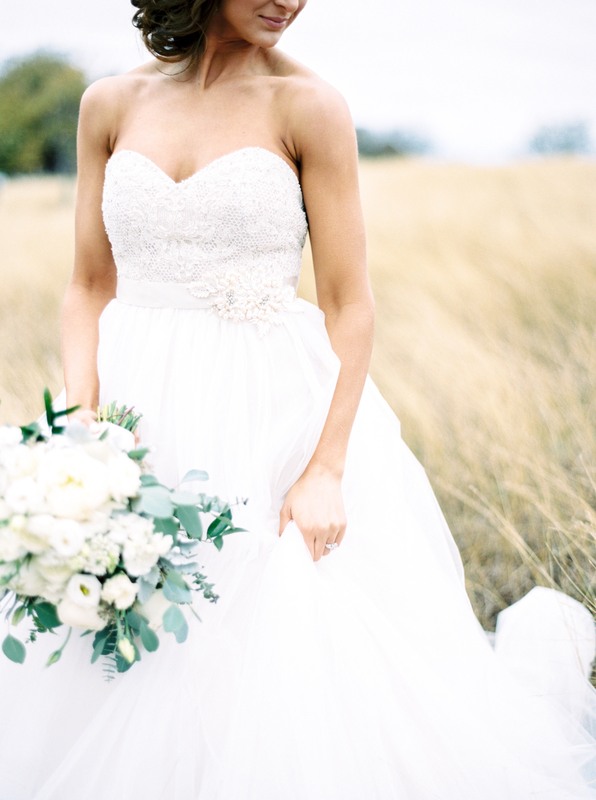 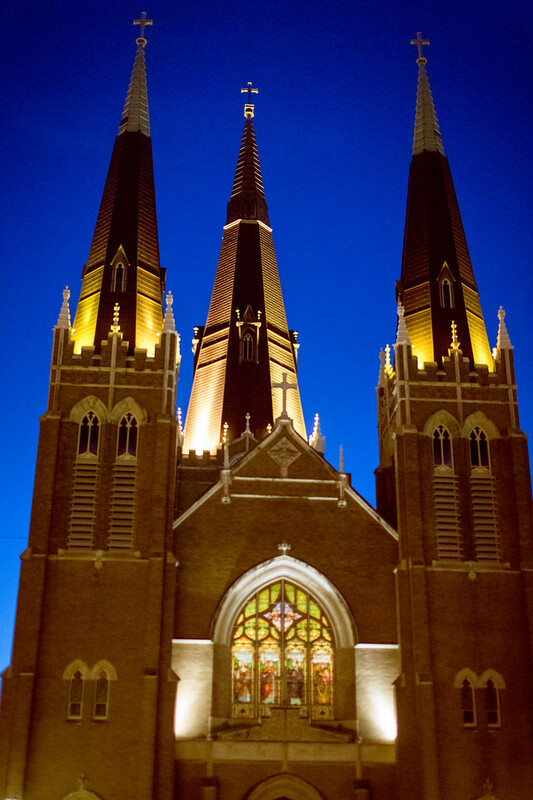 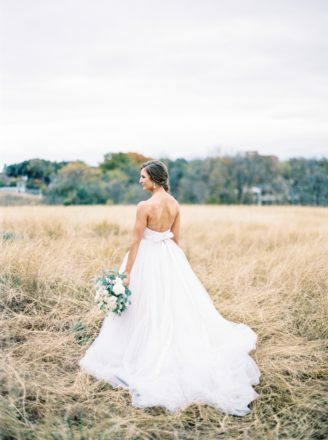 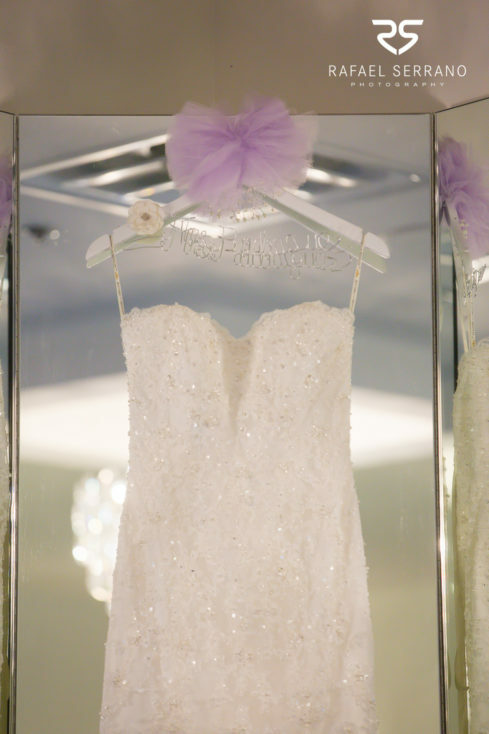 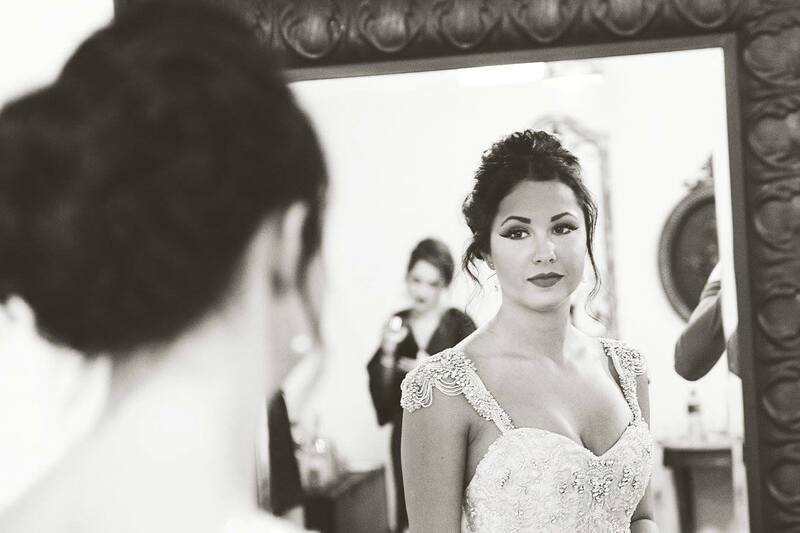 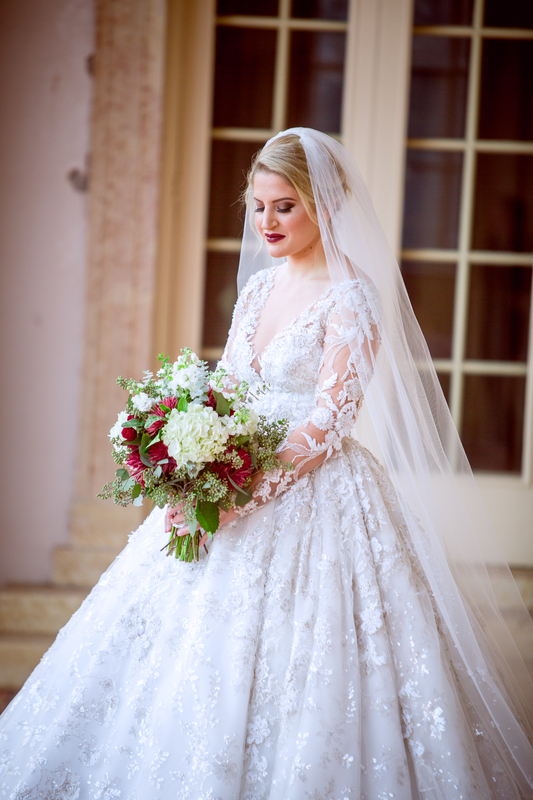 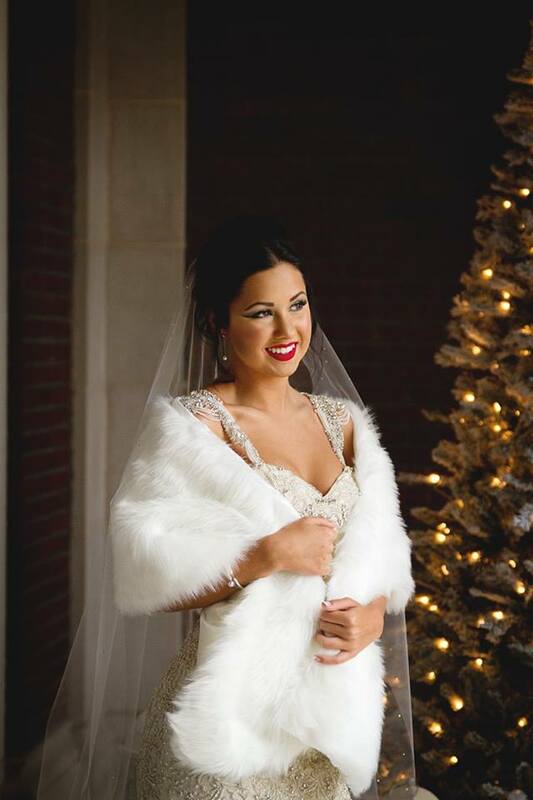 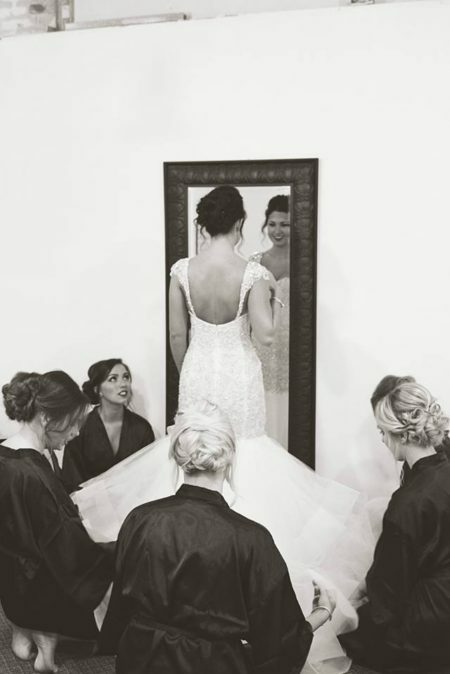 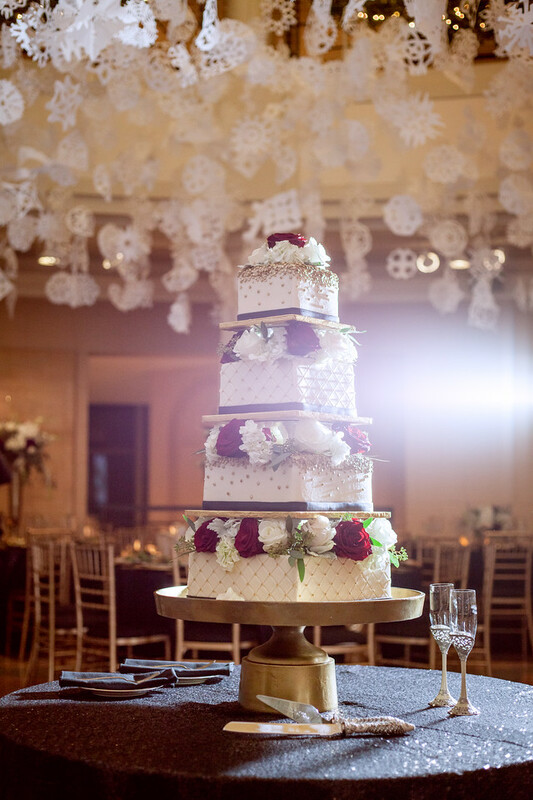 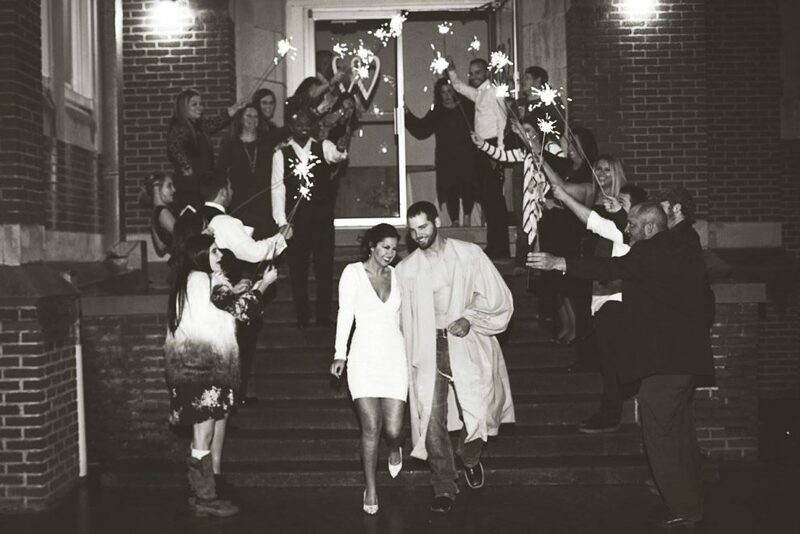 StarDust bride, Katlyn took winder wonderland glamour to the next level for her Oklahoma nuptials last year. 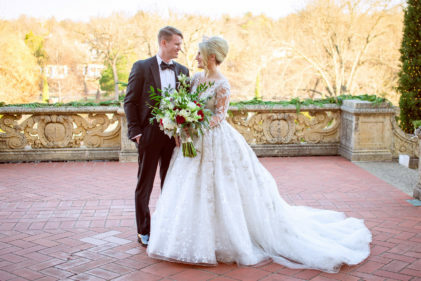 She wore Lazaro gown featuring a beaded and embroidered elongated bodice that explodes into a dramatic tulle skirt with horsehair trim. 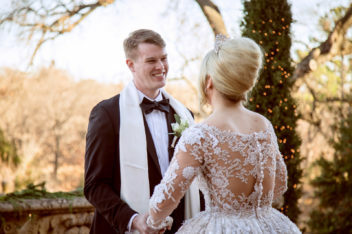 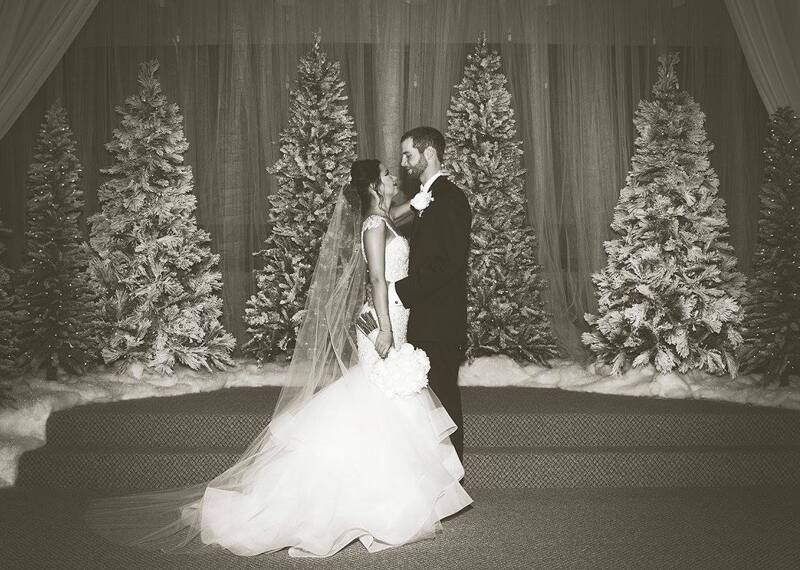 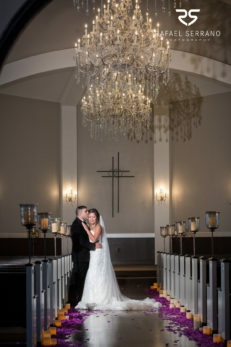 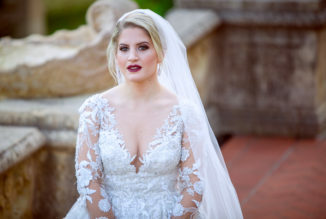 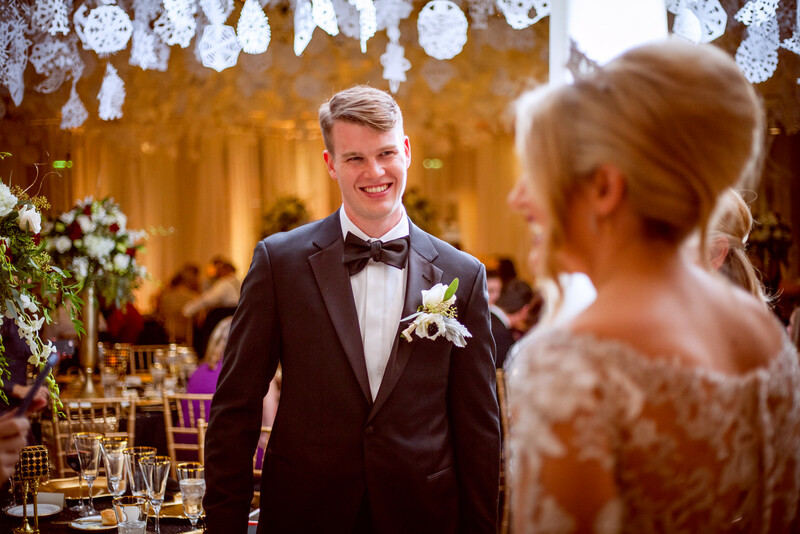 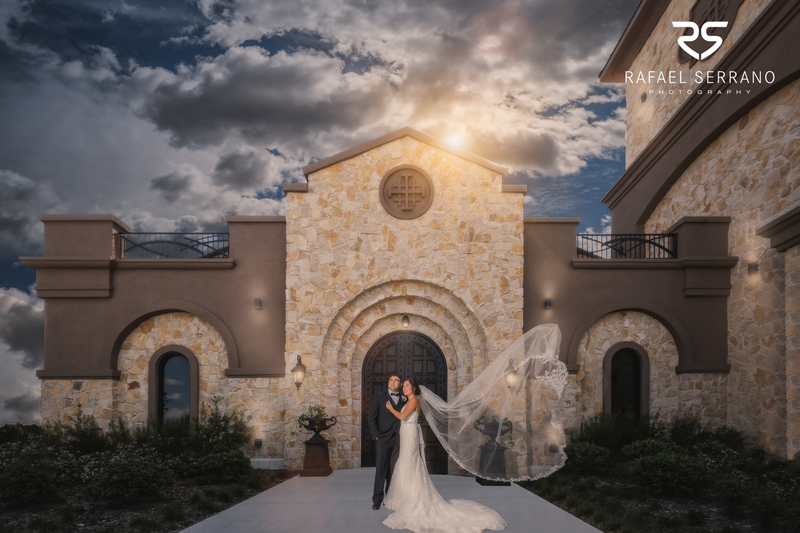 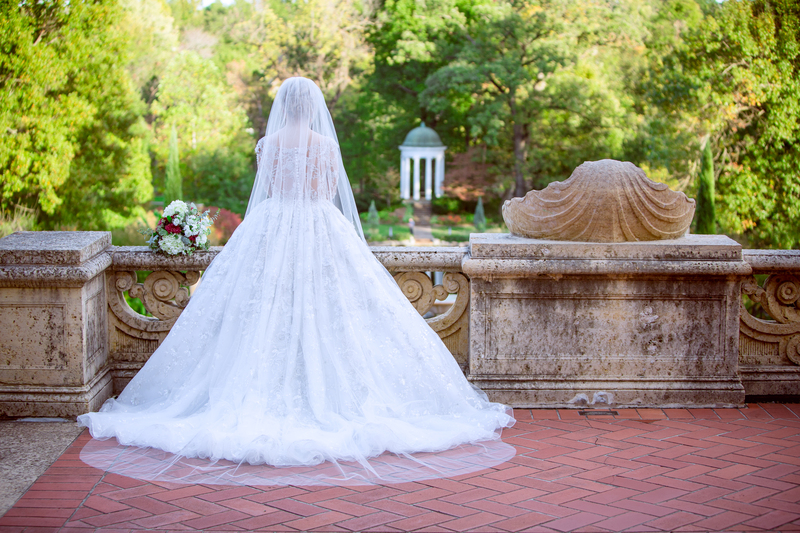 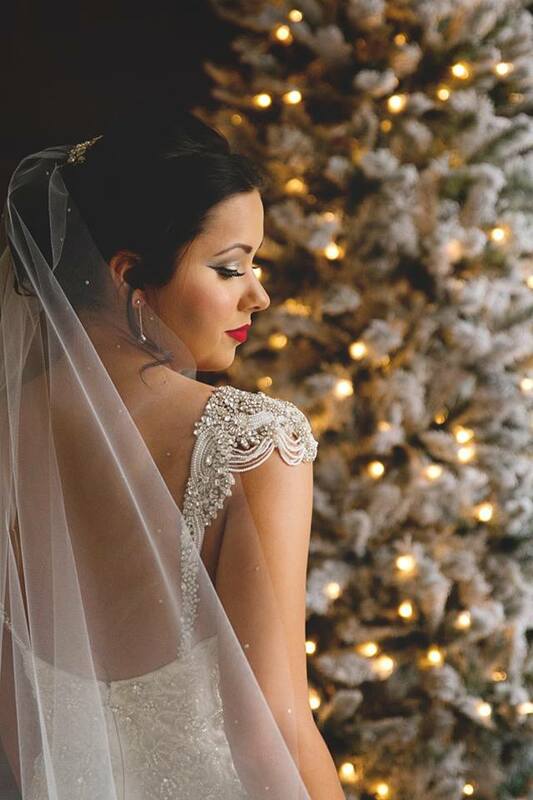 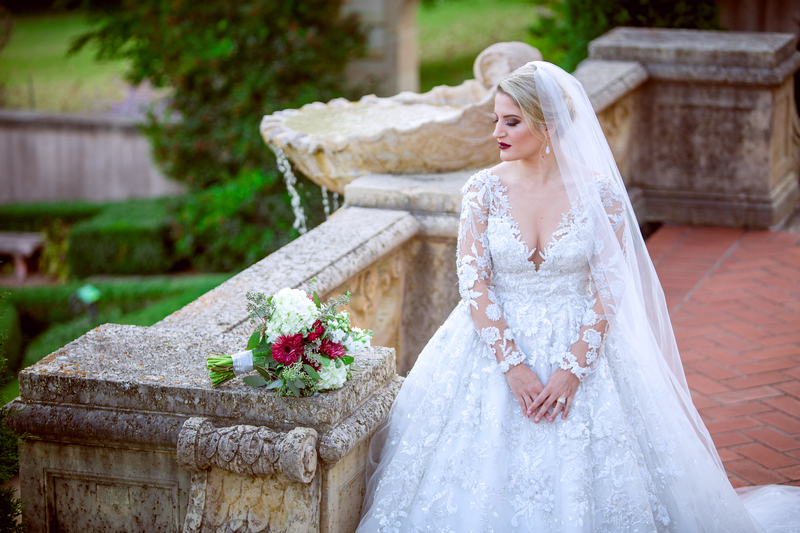 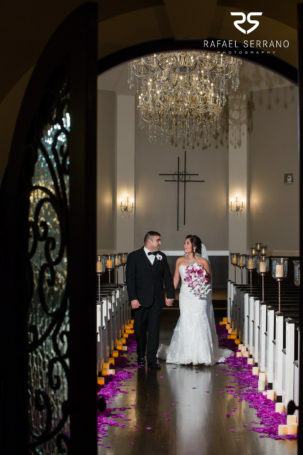 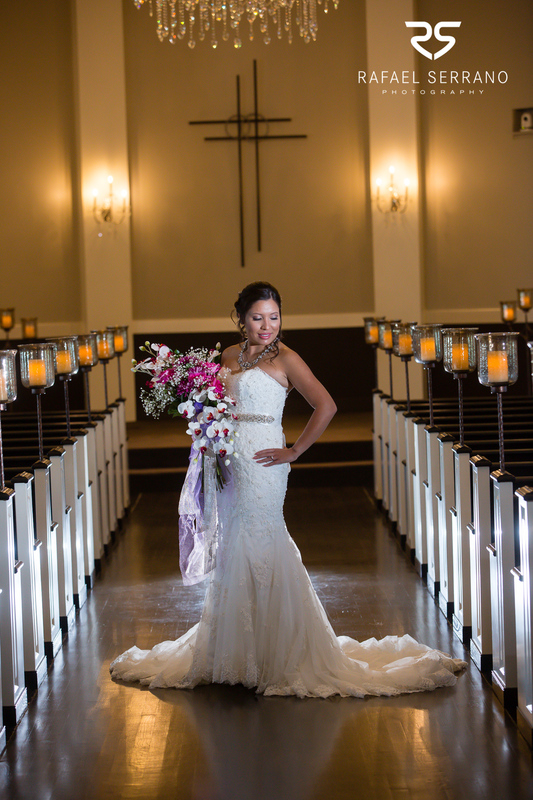 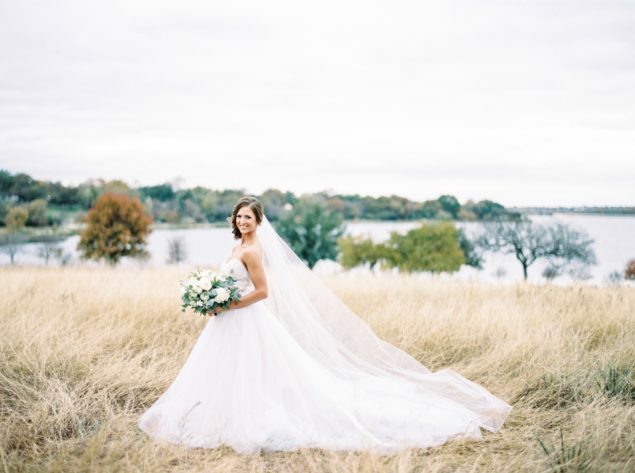 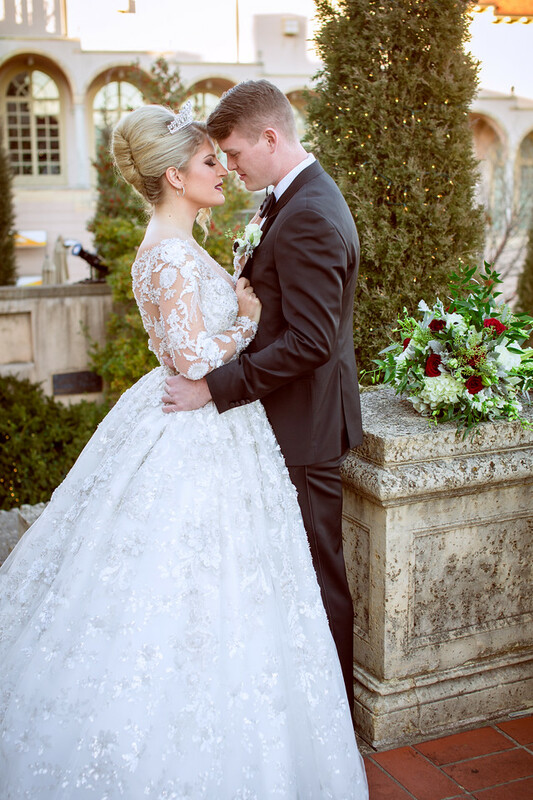 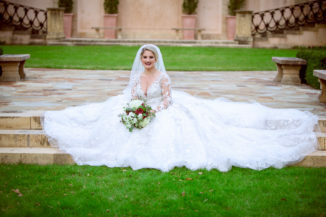 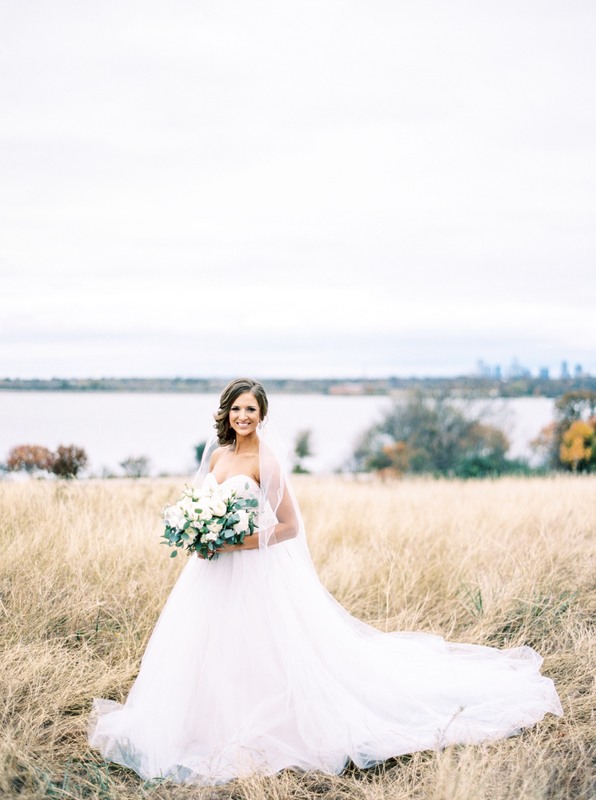 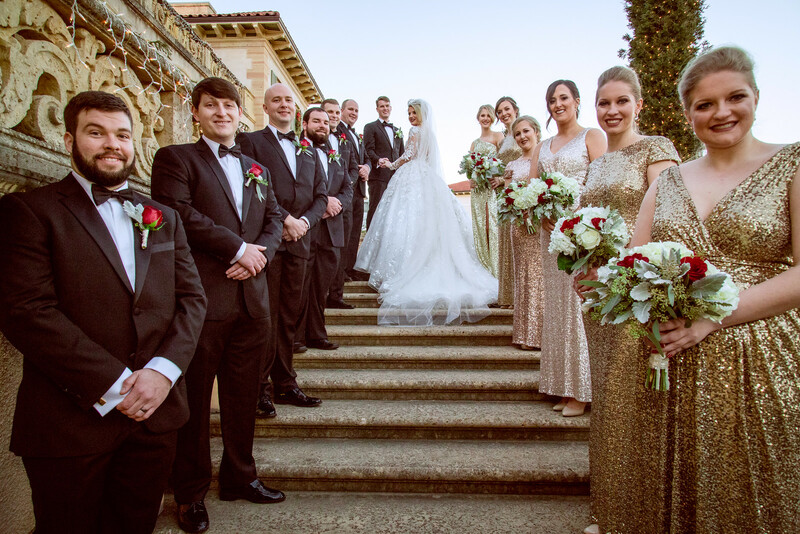 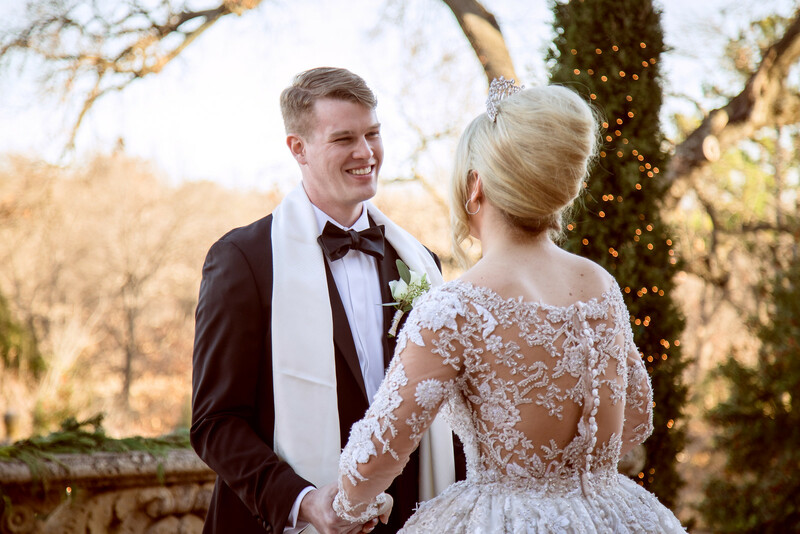 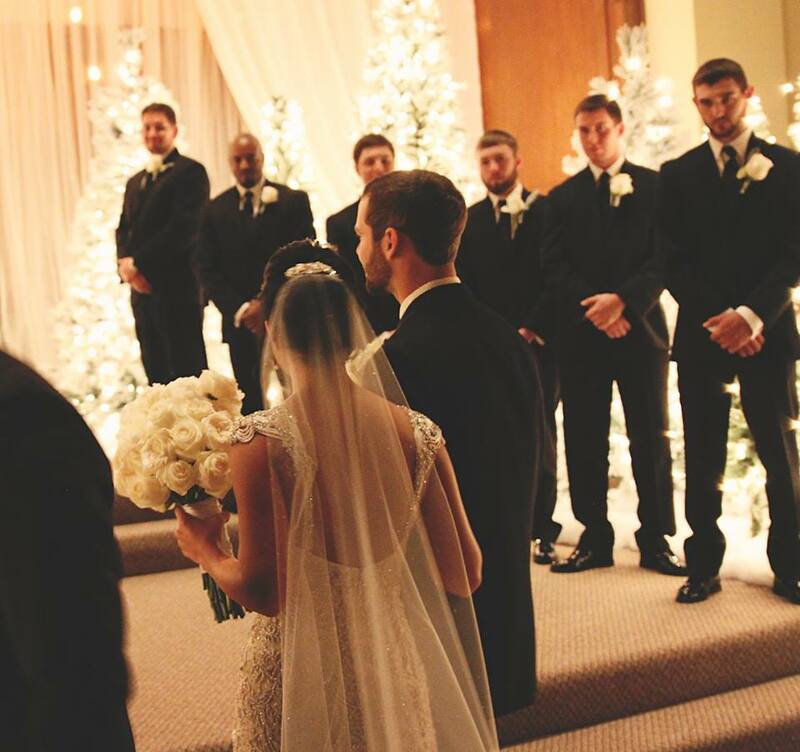 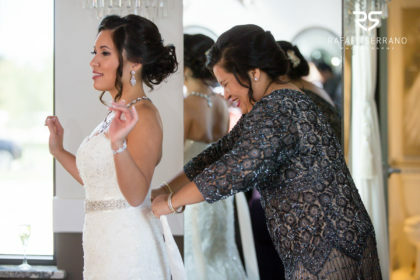 Katlyn’s eye for style took the gown up a notch by adding a custom strap of draped crystals and pearls and a delicately beaded cathedral length veil. Bridal gown: Tracey by Sottero & Midgley from StarDust Celebrations – This enthralling silhouette features splendid embellished lace and tulle curving the hips and leading into beautiful fullness throughout the gently gathered A-line skirt. 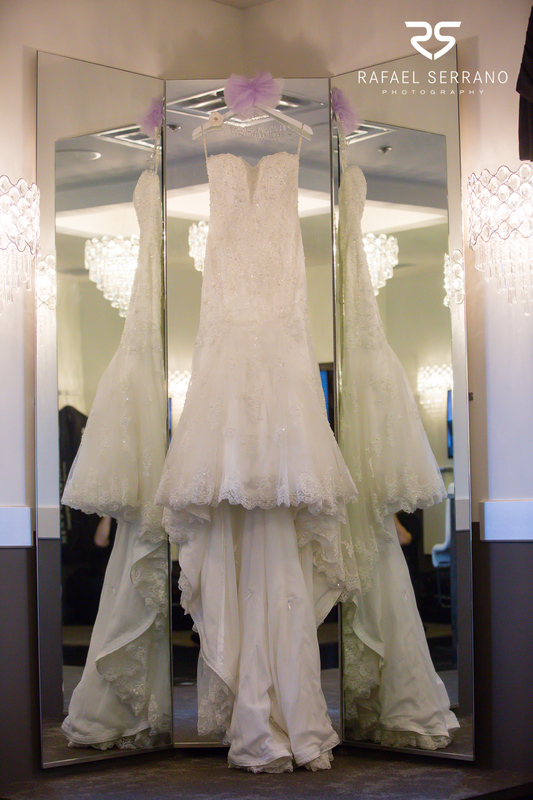 Scalloped edging frames the sweetheart neckline and bottom hem adding to the richness of this phenomenal style. 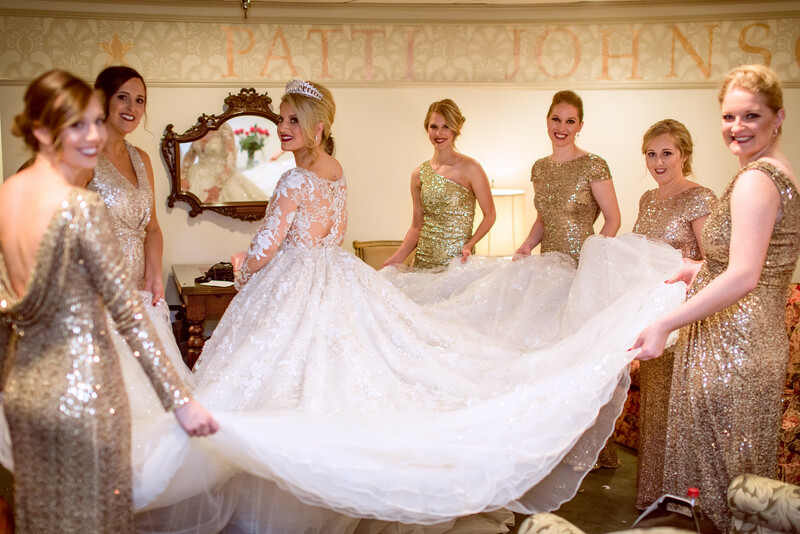 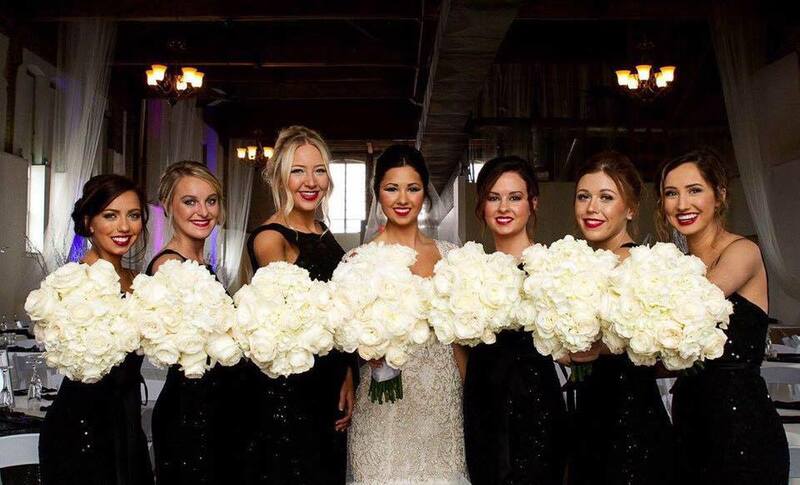 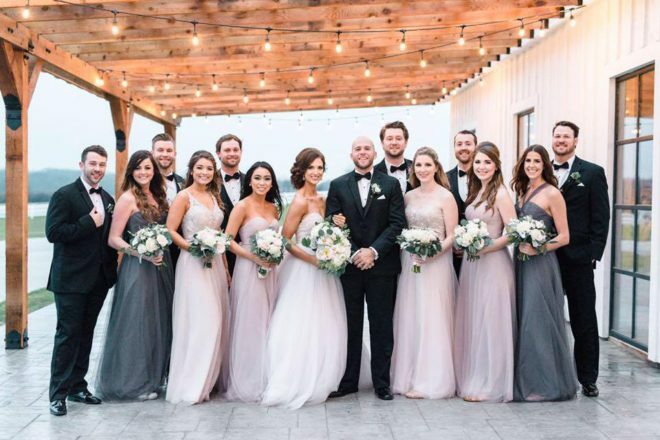 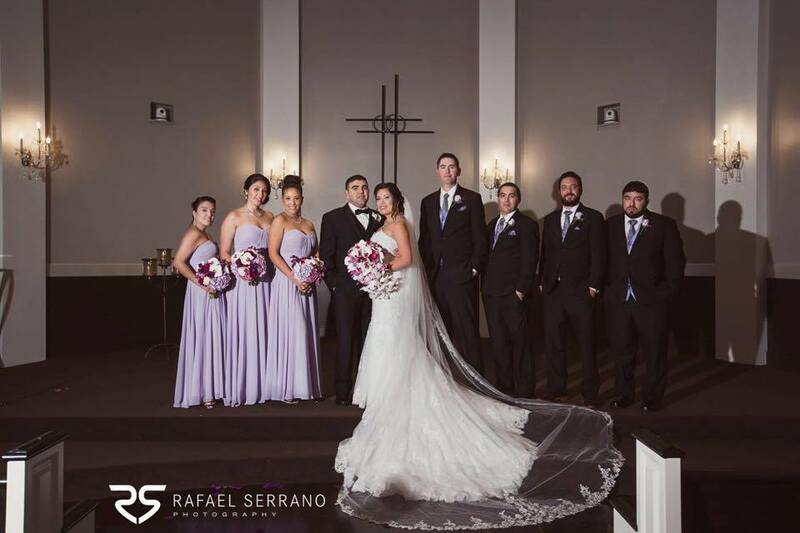 The bridal party was just as stylish in mix and match gowns from WTOO in shades of pewter, jubilee and latte. 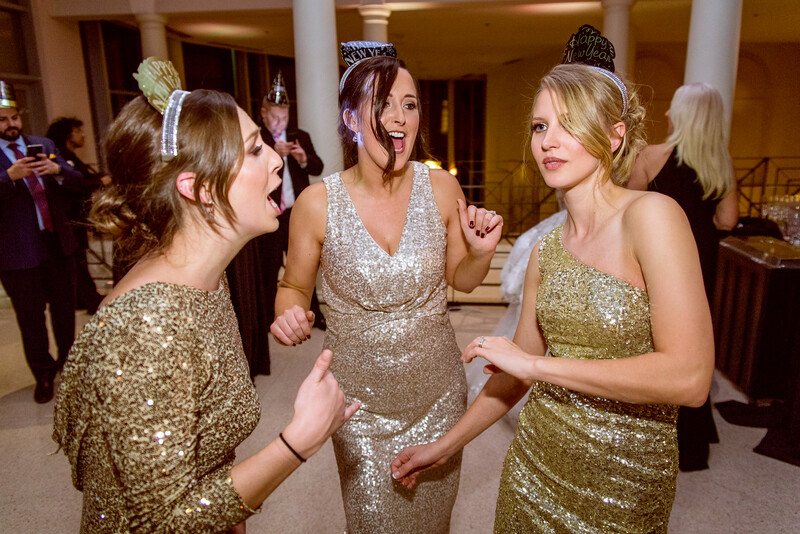 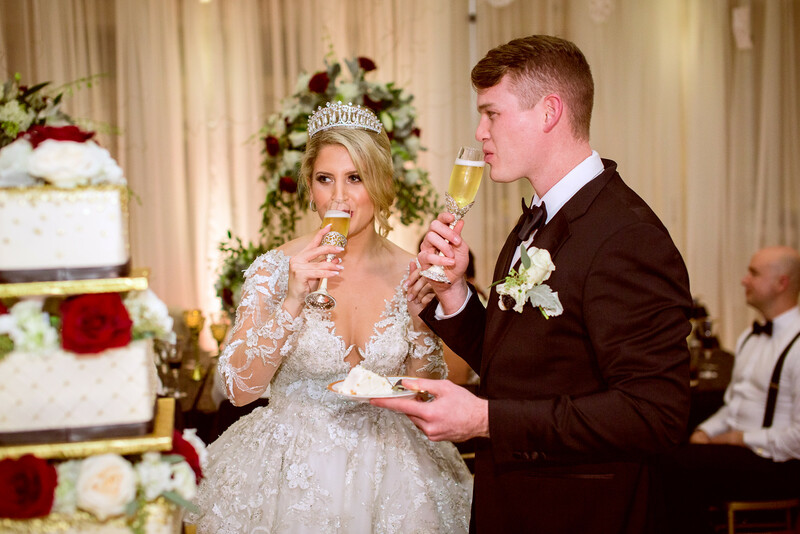 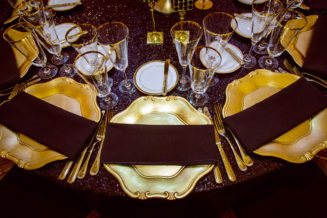 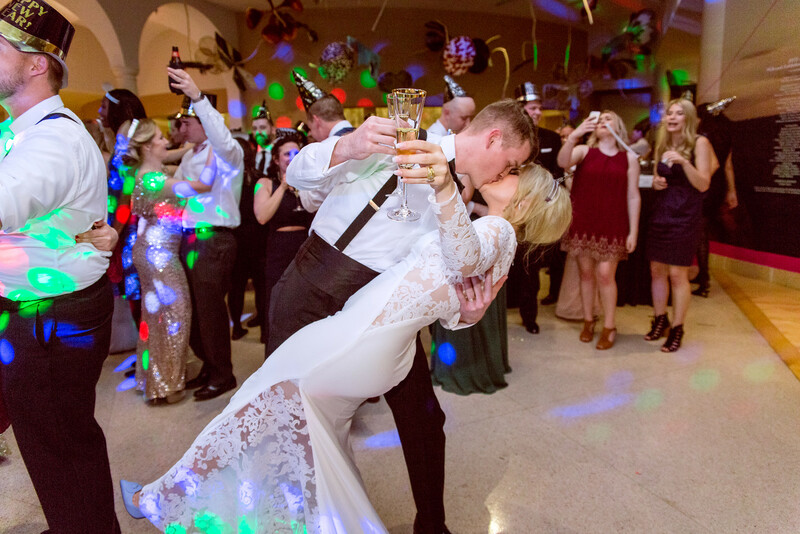 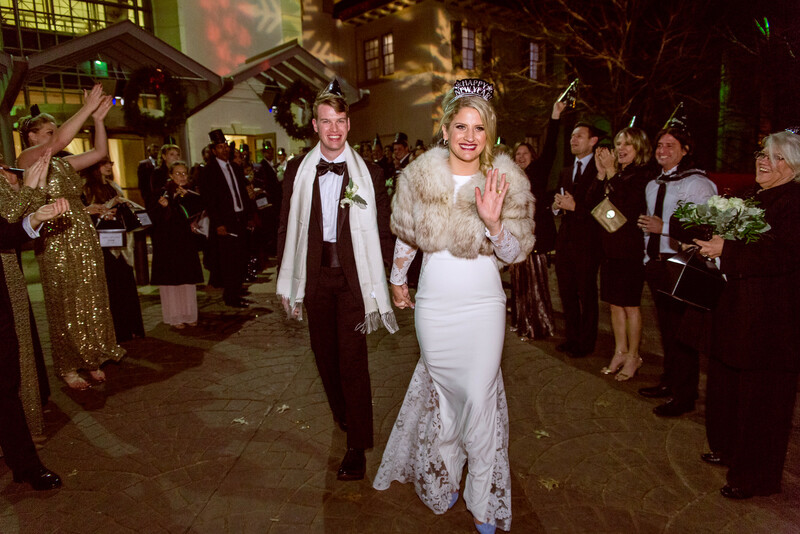 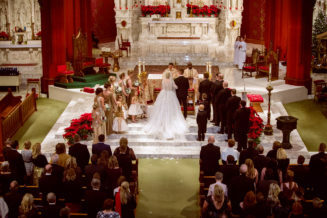 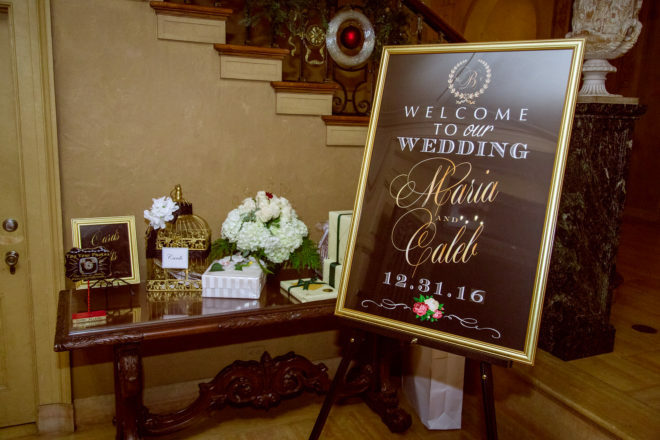 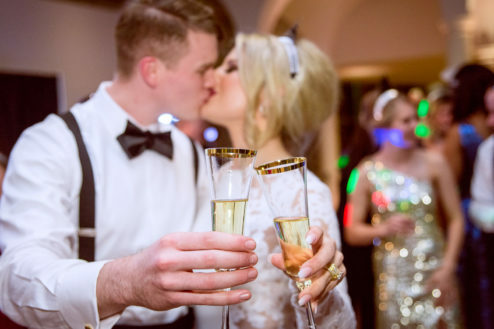 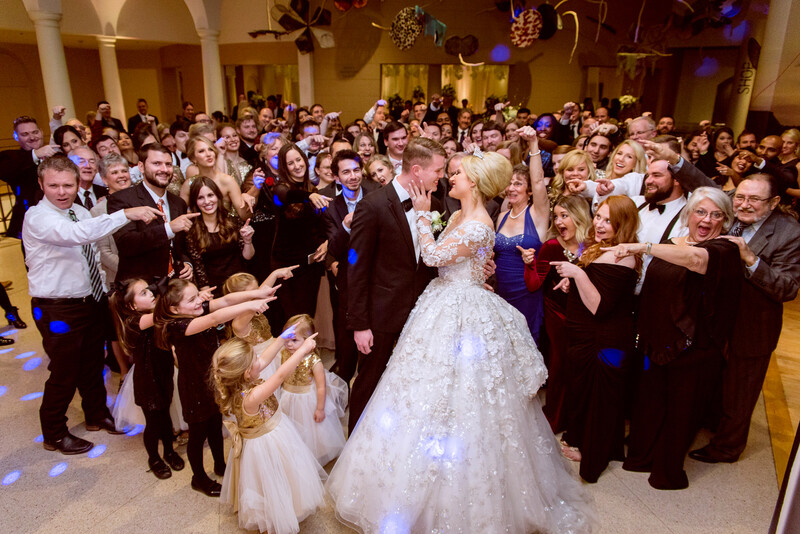 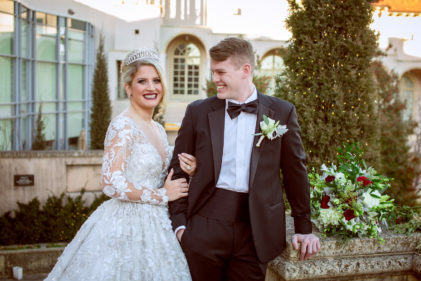 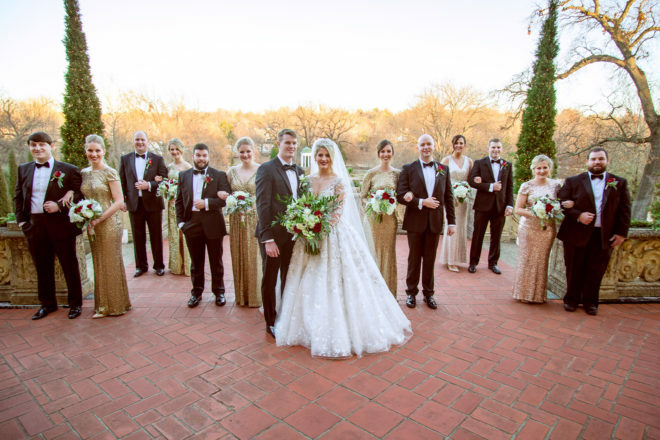 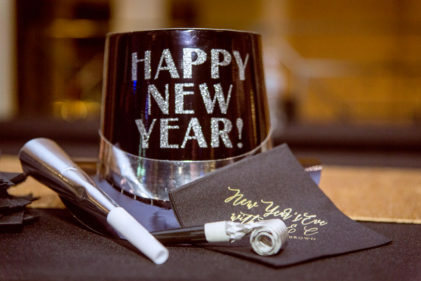 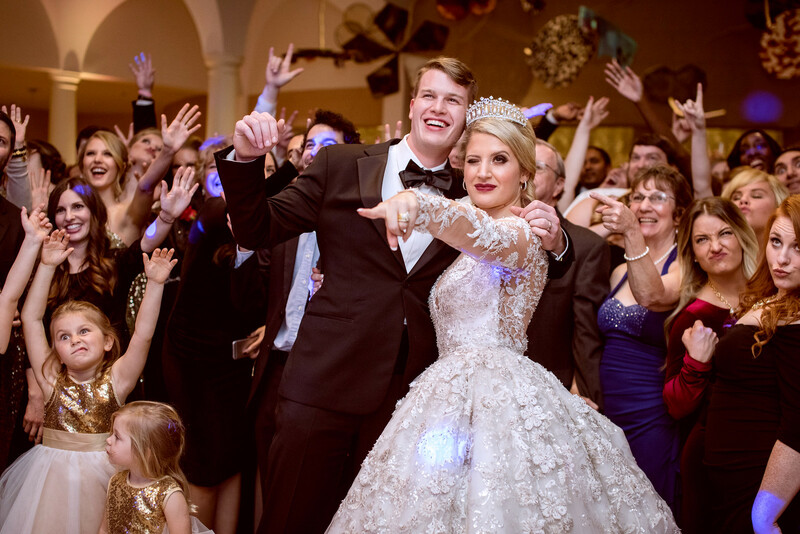 StarDust bride, Maria, and her dashing groom were wed in a stunning New Year’s Eve celebration that could rival any royal wedding. 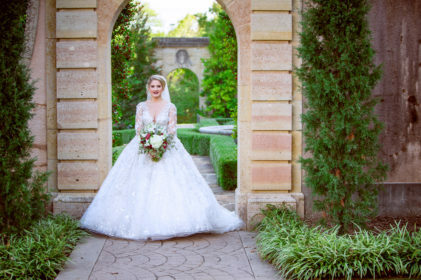 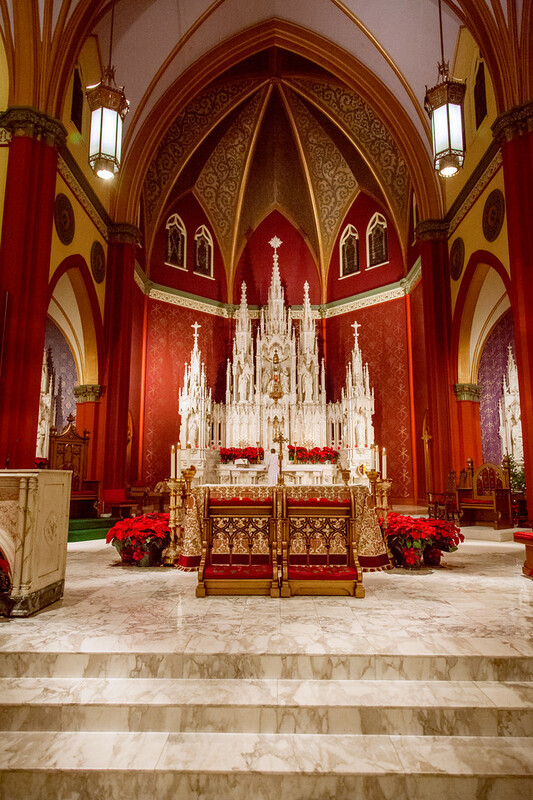 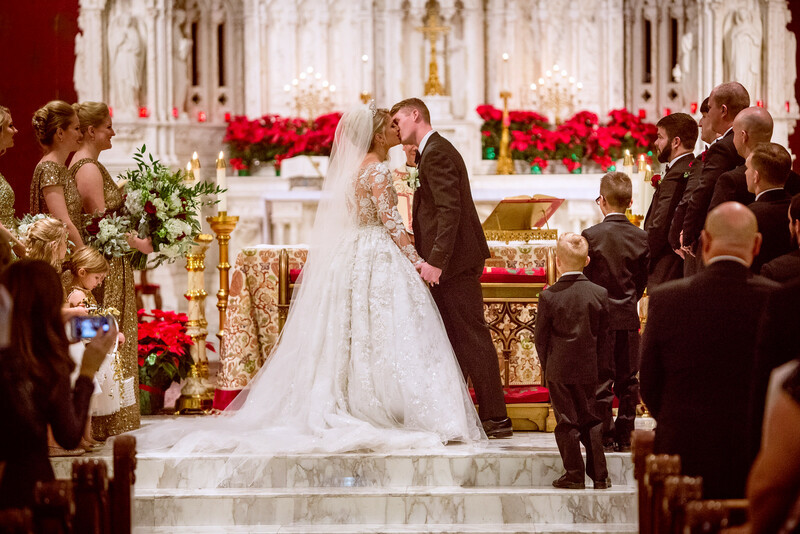 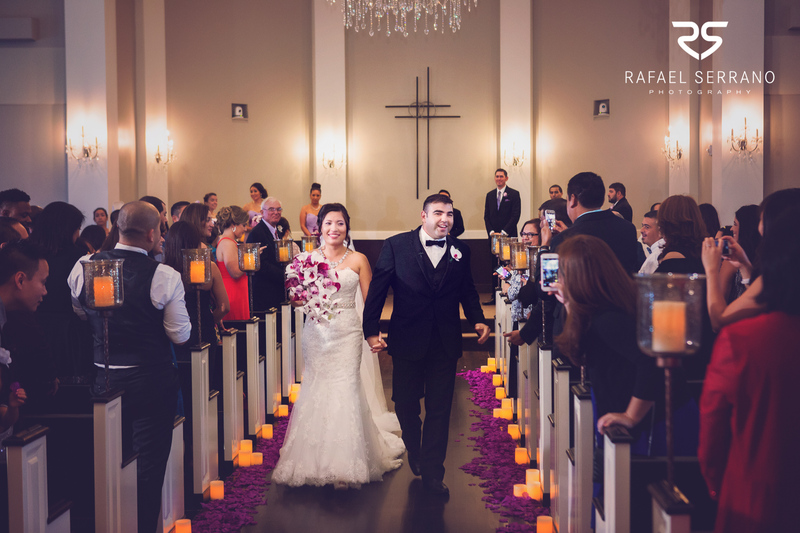 She selected her couture Ysa Makino ball gown with delicately embellished lace applique adorning the long illusion sleeves and low back which was the perfect complement to the cathedral ceremony. 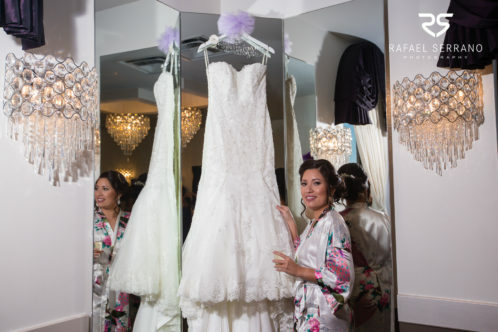 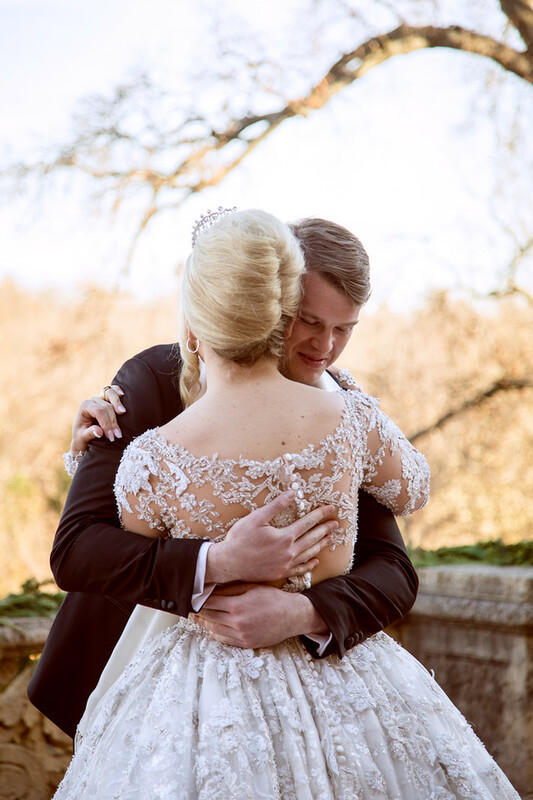 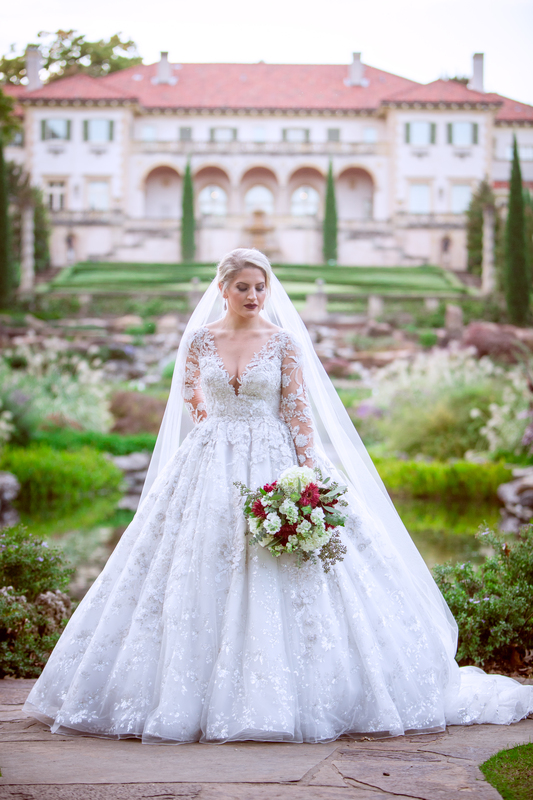 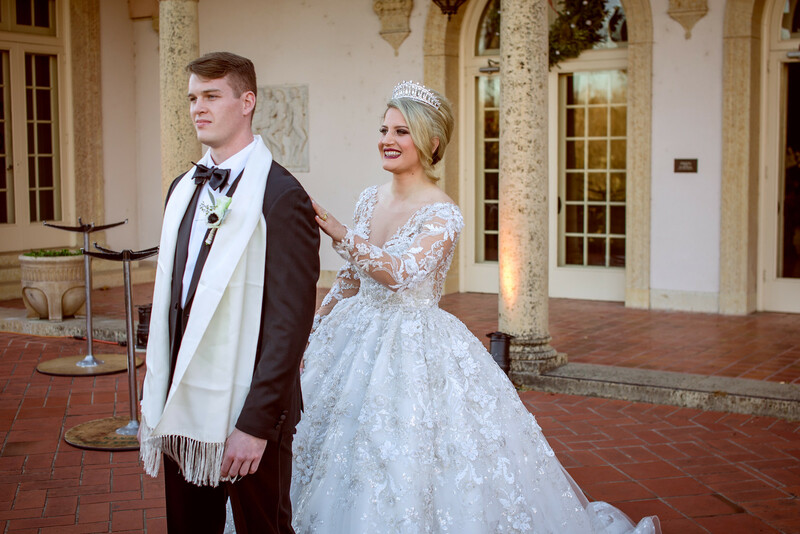 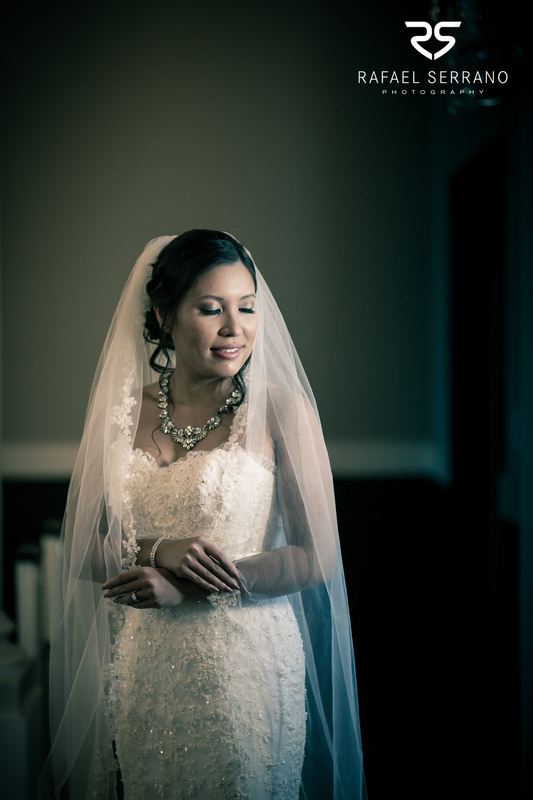 Perfectly accessorized with a dramatic Toni Federici veil and tiara, her bridal generic valium look was European royal elegance meets Oklahoman glamour!